Several weeks ago I announced that Zelda Informer would have a new article series coming soon. This new series, Fact or Fiction in Zelda, would be fueld by you, our faithful fans. In this series, myself, or one of the other Zelda Informer staff, examines theories and rumors, and deduces whether they are fact or fiction. due to all the E3 coverage, and various other projects I’ve been working on, I’m proud to present the first ever Fact or Fiction in Zelda. Exploring several theories proposed by “spaceace76”, this investigative article dives into three tribes in ancient Zelda history to see if there’s a connection between any of them. Are the Sheikah, the Interlopers, and the tribe that created Majora’s Mask related? The Sheikah are a pretty mysterious tribe, with little known about them. The main reason for this being that in every game we’ve seen or heard of them it’s been an ancient tale. At any given time, the only still living members of the Sheikah tribe are those of the Impa family. Still, from the ancient tales, and from a combination of Sheikah artifacts and locales, we can get a pretty good idea of their history. Several sources, including a man in Hyrule Castle Town in Ocarina of Time, and a gravestone in the cemetary of Kakariko Village, reveal that the Sheikah served as guardians to the Royal Family of Hyrule. They protected Hylian Royalty, and in the case of Impa and her descendants, even served as Zelda’s nanny. As evidenced by Impa, a surviving Sheikah in Ocarina of Time, and Sheik, Zelda’s Sheikah-based disguise, they are clearly a ninja-like tribe. Relying on stealth, they are described as “The Shadow Folk” and “The Shadows of the Hylians”. This stealth-based strategy served them well, as a closer inspection shows that their service extended beyond bodyguarding and babysitting. Some relics and buildings left behind by the Sheikah imply their duties more closely resembled that of a group like the FBI or the CIA. All around Hyrule we see Sheikah artifacts known as Gossip Stones, each one containing a piece of information. Their name derives from the fact that their purpose is to listen to the gossip of those passing by, and store it. Only with the Mask of Truth, another Sheikah artifact, can this information be accessed. This is the Hylian equivalent to wire tapping, or monitoring computer usage. These seemingly harmless items spread throughout the entire land were actually a means to spy on all the citizens of Hyrule, as well as the potential enemies in other nations. With the Sheikah under his thumb, the King of Hyrule would have no problem keeping tabs on all those who might oppose him. In addition, the Happy Mask Salesman claims that the Mask of Truth is capable of seeing into other people’s minds. While Link is unable to use this function, when used by the Sheikah, it certainly would have been a powerful interrogation tool. While the Gossip Stones and Mask of Truth provide mental surveillance for the Sheikah, they also created an item for spying on the more physical aspect of the enemy. Using the Lens of Truth, she Sheikah could see through the walls of buildings, view the contents of chests, or see those who are cloaked by magic. The stealth of the Sheikah, combined with their ability to negate the stealth of their opponents, would have made them experts in infiltration and surveillance. Two bulidings in Ocarina of Time can be clearly tied to the Sheikah. The first is the dungeon hidden inside the bottom of Kakariko Well, in which the Lense of Truth is hidden. It is said that a man use to live in a house where the well once stood, and that he had the ability to perceive the truth, possibly tying him to the Mask of Truth as well. As Kakariko in older times was exclusively a Sheikah village, we can safely assume this man was a Sheikah. Inside this little fun house we find blood stained jail cells, coffins, and a host of undead creatures. Secrets hidden behind false walls, and invisible trap doors make the Lens of Truth a necessity to navigate it. The second Sheikah bulding we see is quite similar to the first. The Shadow Temple, also referred to as the House of the Dead, has all that the Bottom of the Well had to offer, as well as a host of other dark secrets. Guillotines, invisible spinning blades, and a boat said to transport people to “the other world” fill the Shadow Temple. An inscription can be found on multiple walls reading, “Here is gathered Hyrule’s bloody history of greed and hatred…”, likely a reference to the reasons for the Sheikah’s dark actions. A cell found below Kakariko Well gives us insight into the Sheikah’s dark side. 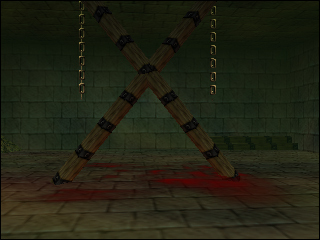 A theme of imprisonment, torture, and death is prevalent throughout the Bottom of the Well and the Shadow Temple. It can be concluded that Sheikah collect information on those who might oppose the King of Hyrule, and then imprison, torture, and evil kill those concluded to be enemies of the state. The fact that a holy temple of Hyrule serves as the execution place for enemies of Hyrule, and even as their “ferry to the other world”, suggests that the Sheikah might be religiously motivated in their actions. The Hylians are said to be the closest race to the gods, and thus, their service to the Hylians could be seen as a holy war. The idea of the Sheikah being religously motivated is furthered by the fact that they seem to have extensive knowledge of the early history of Hyrule, including exclusive knowledge of the Sacred Realm and the Triforce, as well as prophecies about future Hylian events. Most of this is revealed by “Sheik”, who is actually Zelda, and thus it’s possible that these things were actually just Royal Family stories being portrayed as Sheikah stories. However, given that Impa was Zelda’s nurse, it’s quite likely that she learned these tales from a Sheikah. Twilight Princess gives us one last connection between the Sheikah tribe and the gods of Hyrule. The Oocca, the only tribe said to be closer to the gods than the Hylians, live high above Hyrule, and at the time of Twilight Princess, they have lost all contact with Hyrule and the Royal Family. At one point in time, there was a messenger between Hyrule and the Oocca, and in order to communicate with the Oocca, he needed the Ancient Sky Book. This book, containing the language of the race closest to the gods, was left in the protection of the Sheikah. Thus, despite their dark ways, the Sheikah most closely associated to the two most “holy” races in Hyrule. Twilight Princess speaks of a war occuring generations ago, sometime before Ocarina of Time, in which the various races battled to try to find the Sacred Realm. Amongst these combatants arose a powerful group of magic wielders, dubbed the Interlopers. Because of their actions, their dark magic was sealed away by the four Light Spirits, and it became the Fused Shadows. The tribe itself was banished to the Twilight Realm, doomed to live in a world that was a mere shadow of Hyrule. Their descendants, the Twili tribe of Twilight Princess, demonstrate the ability to manipulate light and dark, as well as teleport. When Midna uses the ancient Twili power of the Fused Shadows, it causes her to grow to an enormous size, gaining immense power, and taking a spider-like form. Harnessing the same power of the Interlopers of old, she is able to destroy Ganondorf’s barrier over Hyrule Castle. Midna harnessing the power of the Fused Shadows. A lot of parallels can be drawn between the Sheikah tribe and the Interlopers. Both tribes are closely associated to shadow, and are referred to as the shadows of the Hylians. Both tribes are characterized by having red eyes, and a similar eye symbol is associated with both tribes. Both were involved in the various wars that happened prior to Ocarina of Time, and both tribes ceased to inhabit Hyrule sometime before Ocarina of Time. Of the three tribes in question, this tribe is the one we know the least about. They are only referenced once, but the reference is enough for many to draw comparisons between it and the other two tribes. Again, we see a tribe that has vanished from history associated with a dark mask. Just like the Interlopers, this mask was sealed away “in shadow” by four guardians of the land. 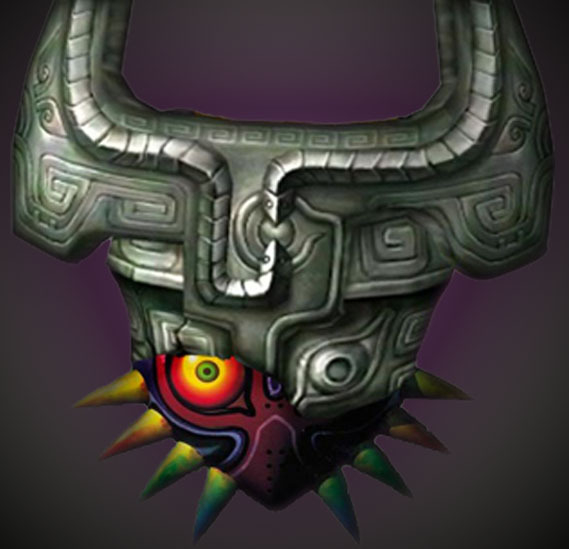 Additionally, there’s an almost undeniable parallel in appearance between Majora’s Mask and the Fused Shadows. A fusion of the two dark items shows their similarities. The fact that the Lens of Truth and the Mask of Truth both appear in Termina, a parallel world to Hyrule, lead some to believe that the Sheikah inhabited Termina at some point. If this is true, could they be connected to Majora’s Mask? Statement: The Sheikah are connected to the Interlopers. Despite the large amount of similarities bewteen the two ancient tribes, the differences are conclusive enought to determine they are not the same tribe. The Sheikah tend to rely on stealth, and specialize in protecting the Royal Family in a political sense. They more closely resemble ninjas than powerful sorcerers. Their association with shadow has to do with their stealth, as opposed to living in a shadow world, or taking a shadow form in the physical world. Though both are associated with a similar eye symbol, this is a common symbol in Zelda, and the Sheikah version differentiates from it, as it is the only such symbol known to have a tear on it. The dark power of the Fused Shadow causes its user to become enormous, in direct contrast to what the Sheikah tribe is known for. Finally, the Sheikah are known to be loyal the Royal Family of Hyrule, the Oocca, and the gods of Hyrule. There’s no indication that they betrayed this loyalty, and if they had, Impa would not likely still be a welcomed member in the house of the Royal Family. So while the Sheikah have a definite sinister side to them, they’re no traitors to Hyrule. The tribe that created Majora’s Mask vanished into legend, a possible indication that they could have fled to Hyrule, becoming the Interlopers. While an interesting theory, it simply doesn’t have enough to support it. The Interlopers used a dark magic for a spceific purpose: the conquest of the Sacred Realm. They did not actually create the Fused Shadows, but rather they were the result of the dark magic being sealed. This contrasts to Majora’s Mask which seems to simply be the embodiment of senseless violence and evil, and is never stated to have been in a different from before it became a mask. For these reasons, to assume the two tribes are one and the same is fiction. The parallels between the two stories are too great to ignore though. We have two tales of ancient and evil tribes who had their magic sealed away by four guardians, and vanished from the land. Termina is a land of parallels, with a counterpart for alomst every denzien of Hyrule. For this reason, and because of the strikingly similar appearance between Majora’s Mask and the Fused Shadows, it can be reasonably argued that the two tribes in questions are in fact parallel versions of each other. There’s no compelling evidence to believe the Sheikah are in any way connected to Majora’s Mask. However, the presence of several Sheikah items in Termina, as well as the fact that the game even makes note that the Mask of Truth was spoken of by the Sheikah, raises some questions. Did the Sheikah discover the entrance to Termina? Given their expertise in surveillance and uncovering that which is meant to be hidden, it’s possible that the Sheikah visited Termina at some point. It’s also possible that the Sheikah tribe simply had a parallel version of themselves in Termina, and like their Hylian counterparts, died out during a past war. In the case of the Mask of Truth, it’s also possible that it was simply brought to Termina by the Happy Mask Salesman. He possesses the Mask of Truth in his shop during Ocarina of Time, and he is one of very few people who has been confirmed to have been to Termina. Hope you enjoyed this first entry in a series we hope will become a staple here at Zelda Informer. If you’d like to contribute an idea to this series, give us your topics in this thread on the forums. If you’d like to discuss or debate this article, feel free to do so either here in the comments section, or in this thread on the forums.